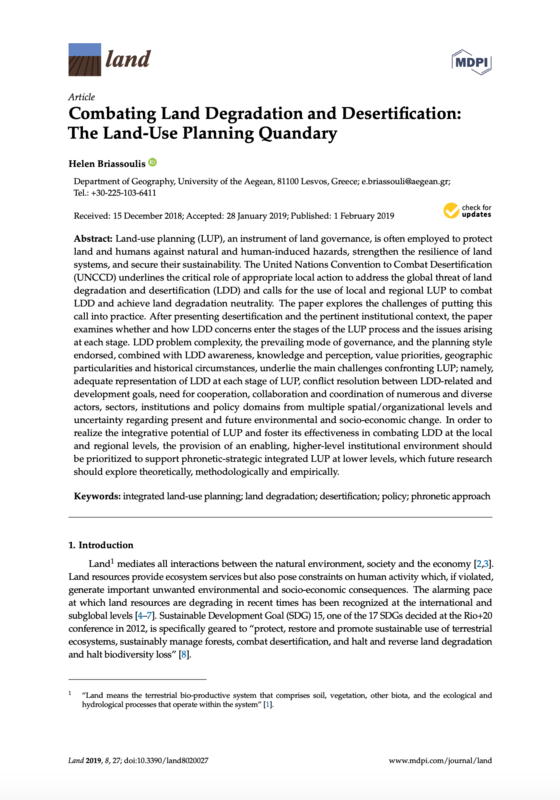 Land-use planning (LUP), an instrument of land governance, is often employed to protect land and humans against natural and human-induced hazards, strengthen the resilience of land systems, and secure their sustainability. The United Nations Convention to Combat Desertification (UNCCD) underlines the critical role of appropriate local action to address the global threat of land degradation and desertification (LDD) and calls for the use of local and regional LUP to combat LDD and achieve land degradation neutrality. The paper explores the challenges of putting this call into practice. After presenting desertification and the pertinent institutional context, the paper examines whether and how LDD concerns enter the stages of the LUP process and the issues arising at each stage. LDD problem complexity, the prevailing mode of governance, and the planning style endorsed, combined with LDD awareness, knowledge and perception, value priorities, geographic particularities and historical circumstances, underlie the main challenges confronting LUP; namely, adequate representation of LDD at each stage of LUP, conflict resolution between LDD-related and development goals, need for cooperation, collaboration and coordination of numerous and diverse actors, sectors, institutions and policy domains from multiple spatial/organizational levels and uncertainty regarding present and future environmental and socio-economic change. In order to realize the integrative potential of LUP and foster its effectiveness in combating LDD at the local and regional levels, the provision of an enabling, higher-level institutional environment should be prioritized to support phrοnetic-strategic integrated LUP at lower levels, which future research should explore theoretically, methodologically and empirically.